Apartment is located in the yard, away from the street, so it's pretty peaceful. Three supermarkets are near the apartment, 5-10 minutes away. The apartment is comfortable, and the heathing was good. Good location - It's half an hour-hour (by foot) away from city attractions in the old town, and 15 minutes from Danube. The location is nice because public transport and grocery stores are very nearby. 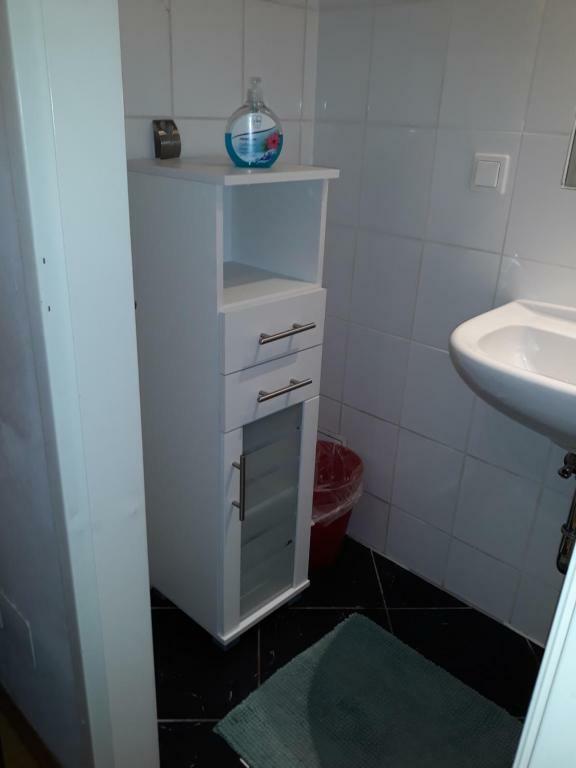 Excellent location, very quiet place, very clean, excellent value for money. Good location. You can get the old town for 15 minutes. This hostel is quiet and clear. I recommend it! Near the city center, easy access to public transportation. Very polite people ready to help you..
One of our best sellers in Vienna! Apartment Dahlia is located in Vienna’s 9th district, a 20-minute walk from the city center and a 3-minute walk from the Währinger Straße Underground Station (line U6). Tram lines 5, 37 and 38 stop right outside. Free WiFi is available. The apartment overlooks a quiet interior courtyard. The kitchen features a coffee machine and kitchenware. The bathroom includes a shower. The Vienna Volksoper, a supermarket and various restaurants are within a 3-minute walk. The Friedensbrücke Underground Station (line U4) is a 10-minute walk from Apartment Dahlia and offers direct connections to Schönbrunn Palace. When would you like to stay at Apartment Dahlia? This apartment has a dishwasher, satellite TV and kitchenware. It's small but Cosy. A quiet place near Centrum and friendly people. Tram and Bus station direct in front. Metro station 5 minutes to walk. Supermarkets and Restaurants near by. I am living in the same house. Shops, Bus, Tram direct in front. Supermarket, Restaurants and Metrostation close. 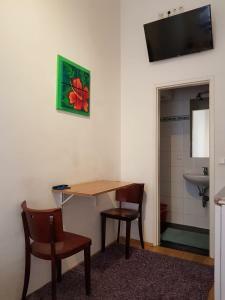 Centrum 20 min walking distance Volksoper 10 Minutes walking distance. House Rules Apartment Dahlia takes special requests – add in the next step! Booking.com takes your payment on behalf of the property for this reservation. During your stay, you can pay for any extras using JCB and UnionPay credit card . Please let the property know your expected arrival time at least 1 day in advance. You can use the Special Requests box when booking or contact the property. Please note that arrivals after 22:00 are only possible upon prior confirmation. Please note, that guests have to pay for any damage in the apartment caused by them. Please inform Apartment Dahlia of your expected arrival time in advance. You can use the Special Requests box when booking, or contact the property directly using the contact details in your confirmation. It was a bit tiny and the bathroom had no doors but that are only small inconveniences. No door to the bathroom, floor was not very clean, walls need to be pained. The bed wasn't comfortable so we had a bad sleep. Toilet and shower are in different rooms. The sheets and towels maybe they were not changed after the last residents, because we found hair on them and the towels were smelly.. The bed is actually a sofa opened to be a bed.. The apartment was perfect in everything. It was super clean, the furniture was new and was arranged efficiently. Big windows to let the light come inside. Comfortable beds and pillows. There was also a big screen tv in the bedroom. The Kitchen was perfect for 2 people: in a little space could arrange the fridge, the oven, the dishwasher, a table for 4 people and even the water boiler for tea and the coffee machine. The bathroom was equipped with the washing machine. We were given two keys upon check in. From the 3 doors that we had to use on an everyday basis, the one to the building where the appartment was, we could say the second door, I guess, we were not given the key to. Once, this door was either locked or partially busted at night when we were in a hurry so we were not able to enter the building for a few minutes. We had to improvise opening it with another key of ours that we happened to have at the time that kind of did the job and partially opened it with a lot of difficulty it in the end. But I must admit it was a worrying moment. Pedro, was very kind when we met once upon check in. Location was excellent. Great find with parking in central Vienna, location perfect for us! Towels a little smelly. Kitchenette poorly stocked. Check out cleaner arrived before checkout. The owner did not provide anything special or extra. Just bare minimum. Hosts attitude, rushness and behavior. Toilet paper, please give us a couple more rolls of toilet paper. It's cheap. We were sick and didn't need to worry about running out, 1/2 a roll? I asked and only got one, we ended up buying out own.